Tuesday, 5 February 2019, 5:05p.m. Emergency services are telling residents of Eves Valley to evacuate after a 120-hectare fire continues to blaze near Nelson. 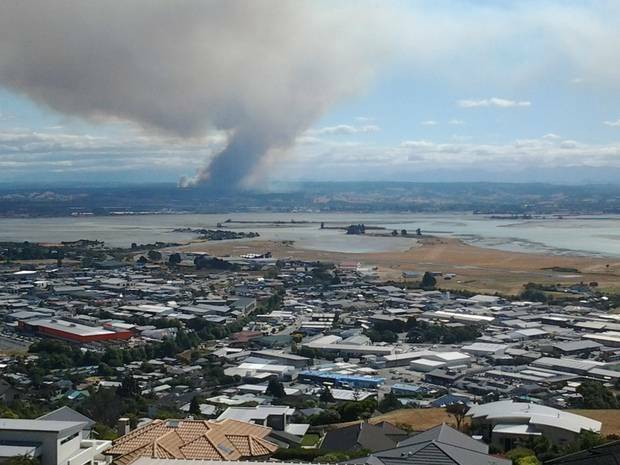 "The fire that began mid-afternoon is currently covering 120 hectares and is growing in a Northeasterly direction in dry hot conditions and strong winds," Tasman-Marlborough Fire Area brigade said on Facebook. "Residents of Eves Valley residents and the Eves Valley Saw Mill have been advised to evacuate," the brigade told people in the area. "Teapot Valley residents are advised to get themselves ready for evacuation if the need arises as there will not be much time," it said. Three helicopters have been tasked to tackle the blaze, along with fire crews from throughout the area. Fire and Emergency New Zealand were called to the area around 2.15pm after reports of smoke. Police said in a statement they were called to assist Fenz around 3.15pm. Motorists are also being asked to avoid the area. MetService reports the Nelson region has a current temperature of 28.1C with 30km/h southwesterly winds. Stephen Cox said the Nelson area hasn't seen rain in over a month and along with dry conditions, the wind is helping to fuel the fire. Cox said he first heard sirens shortly after 2pm and only a small plume of smoke could be seen, however, now he says there is a "huge ball of smoke". "[It has been burning] at least two and a half hours ... there was only a small amount of smoke but since then we've had multiple fire engines, multiple police vehicles all hurtling out there," he said. "We haven't had rain here for weeks and weeks and there's quite a strong southwesterly wind helping the blaze." "There's just a huge ball of smoke and [water] tankers going out there and fire engines going out there." Meanwhile, across Cook Strait, fire crews in Kapiti are fighting a mostly contained grass fire on Te Hapua Rd south of Te Horo. A Fenz spokesperson said seven appliances are on the scene after the fire escalated to the third alarm earlier this afternoon. Firefighters in the South Island were kept on their toes yesterday as separate fires in Canterbury and North Otago create headaches. Plumes of smoke from a scrub fire which runs alongside State Highway 1 in Templeton, near Christchurch forced the closure of the highway. The large blaze was ignited by a passing train around 3.30pm, a Fire and Emergency New Zealand spokesman said. Earlier today firefighters were called to a blaze that broke out in the Whakarewarewa Forest in Rotorua. The fire was about 20m by 30m in size and just 100m from a primary school.